One of the reasons I am taking part as a ‘student’ in the Gamestar Mechanic Summer Learning Program is to understand better how to give feedback to my students during our video game design unit. 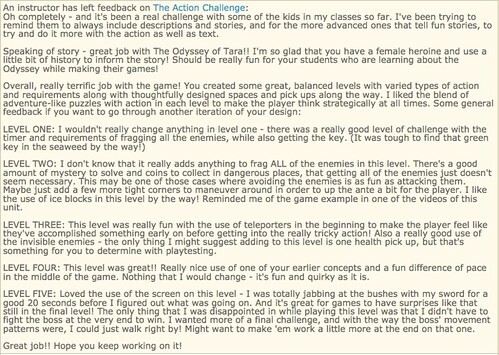 This morning, I received some fantastic feedback on my game (shared here yesterday) called The Odyssey of Tara. (I invite you to play the game). Notice the balance of positive to advice, and also, how detailed the comments are. As the game designer, I can tell that not only did my teacher play my game, but they were making notes about each level, and offering up their own experiences as an outside player and as a game designer. That kind of duel views is helpful when creating a video game. Now, I need to step back myself and see the game through their eyes.